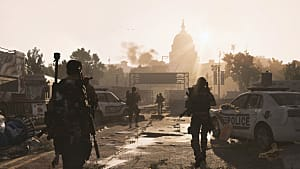 Tom Clancy's The Division 2's first major content update, Tidal Basin, went live last week. Part of the celebration for the new content includes yet another brand-new event, dubbed Apparel Event #1: Invasion. It started April 5 and is running until May 2. Starting the event requires a small update. There was a bug that blocked off some of the event activities. It has since been fixed, but after the fix some received a message stating the event had ended. If that should show up when you try and start the event, simply log off, restart, and log back in. Despite being part of the recently released Tidal Basin update, it appears the Invasion Apparel Event is available for everyone, not just for World Tier 5 players. However, some projects are only available or repeatable by higher World Tier characters. What is the Invasion Apparel Event? 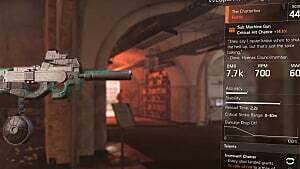 The Apparel Event gives players a chance to earn and find unique cosmetic items. 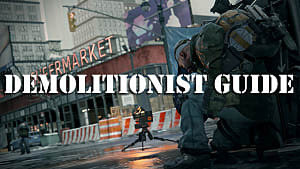 There are 30 items to collect in total, including outfits, a mask, nine weapon skins, and four emotes. 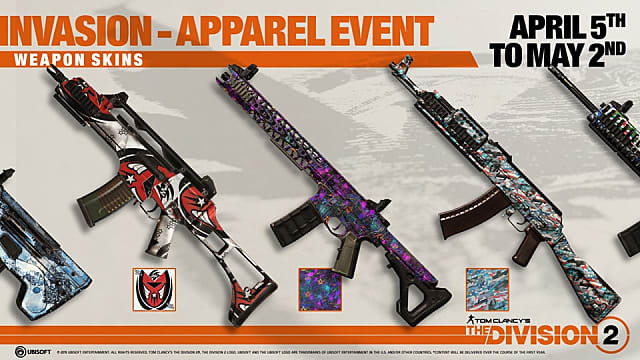 These apparel items are new to the game, but won't be exclusive to Apparel Event 1. Should you miss out on them during the event, you'll still get a chance to find them in Apparel Caches afterward or you can purchase them directly using Premium Credits via the Apparel Store. 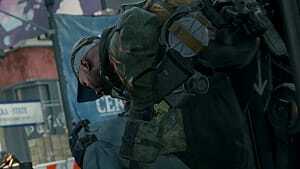 Completing all three outfits earns you a new mask. And if you do manage to gather all 30 items during the event, you unlock the special Black Tusk outfit, which is only available during the Invasion event. The outfits are based on D.C.'s 3 factions, and the different components are listed below. Thanks to Reddit user toilet_drake for compiling the names of each piece. The Apparel items come in special Apparel Caches, sometimes called Crates. 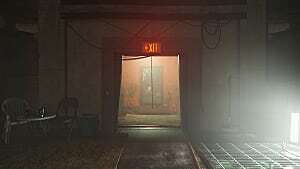 These are the Event Caches mentioned in Ubisoft's Year 1 Content Update. 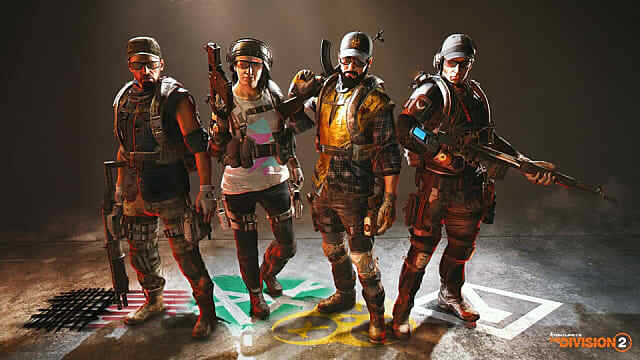 When that update was outlined, Ubisoft assured players that Event Caches would never contain duplicate items, which means you won't end up with, say, 25 True Sons scarves. Instead, there's a finite number of Apparel Caches you'll find; when you've gathered all the Invasion Apparel items, you stop finding Invasion Apparel Caches. 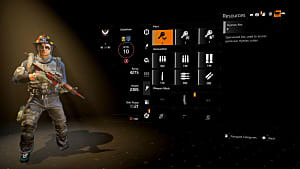 You can see what could possibly be inside before choosing to open it, plus what items you've yet to collect from the Apparel section in the game. 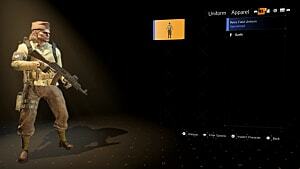 The Event Apparel Caches are under the Apparel Cache section of the game menu, next to the Premium Credits option. To open an Apparel Cache, though, you need an Apparel Key. 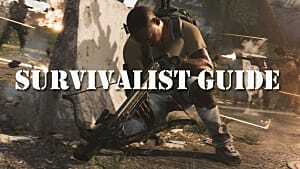 There are multiple ways to earn keys. The first is by completing Apparel Projects each week; completing one gives you 3 Apparel Cache Keys. Another involves leveling up. After level 30, there is a chance an Apparel Key will appear upon reaching Field Proficiency each time you level up. There's also a chance an Apparel Key will drop when you reach Dark Zone Proficiency. So, 30 Invasion Apparel Cache Keys would run you approximately $30, unless you go over the 3,000 Premium Credits needed for 30 keys. Those who log in during the event's first week, ending April 12, will receive one free Invasion Apparel Cache Key. Players who are Year One Pass holders will also receive 3 free bonus keys that can be claimed any time during the event. The first three methods for obtaining keys run from April 5 through April 25. It should also be noted that the chance of an Invasion Apparel Cache Key dropping after leveling up, as mentioned in the second and third methods, is completely random. 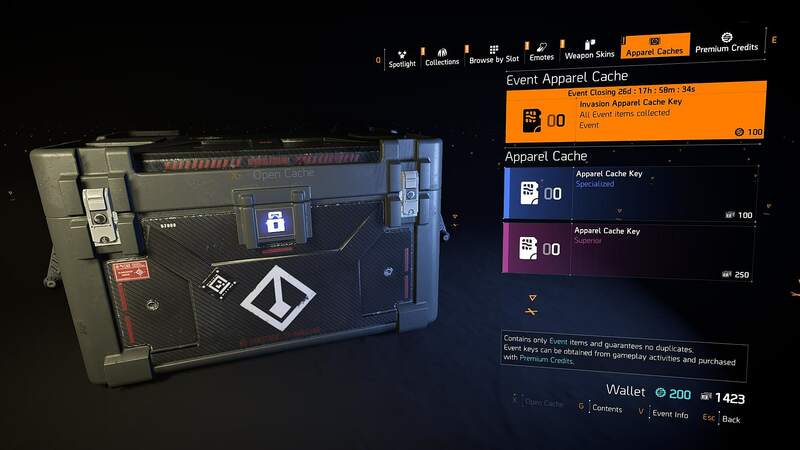 The event closing period lasts from April 25 through May 2nd, and according to Ubisoft, you can still use unspent keys during that period and purchase additional ones to unlock the remaining Invasion Apparel Caches. From May 2 forward, all items are moved to standard Apparel Caches, save for the Black Tusk outfit. 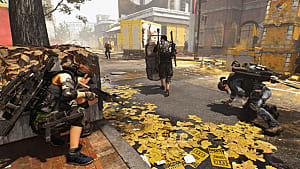 If you need some further assistance while you're scouting DC for apparel, be sure to check out our other The Division 2 guides, including this The Division 2 leveling and endgame preparation guide for help reaching those higher levels and getting more chances to gain Invasion Apparel Cache Keys.